This just popped up on Twitch.tv, it's a livestream of pre-alpha gameplay of the long-lamented Star Wars: Battlefront III, by Past to Present Online. Though reports suggested the game was "99 percent done" when LucasArts scrapped it, obviously you're seeing something in a pre-alpha state here. Word is that this version, by Free Radical, came eight months before LucasArts told it to shut the project down in 2008, apparently unwilling to spend on the marketing necessary for such a title. LucasArts itself ceased all games development at the beginning of April, taking down with it this and other projects. The publisher was known to be working on a Battlefront-like game called First Assault last year. 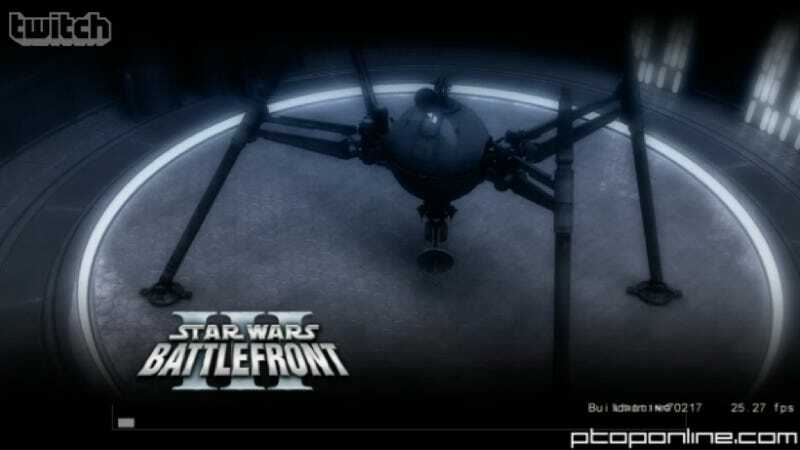 It was scheduled to come out in the spring and was a test of sorts for an all-new, all-different Battlefront III. Development of that project didn't get far, but you can see footage of it here. If the livestream below is stopped, stick with it, it's likely a map or play instance being changed out. PtoP's livestream can also be seen here. [Update] Show's over, but the original livestream is archived by PtoP right here. It also has a repository of other Battlefront III videos here.